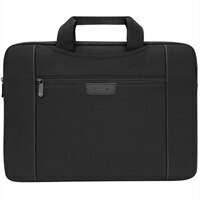 15.6" Slipskin Sleeve with Handles, BlackRamp up your versatility and your protection with a case for 15.6” devices that can be used two ways. This cushioned 15.6” Slipskin Sleeve has handles that tuck away into pockets so that you can slip it into another bag. A front zippered pocket is ideal for holding a charger and small personal items. Great for school or working at the closest café, the sleeve has the flexibility you want and the protection you need in an ultra-slim case that delivers ultramobility. Ramp up your versatility and your protection with a case for 15.6” devices that can be used two ways. This cushioned 15.6” Slipskin Sleeve has handles that tuck away into pockets so that you can slip it into another bag.